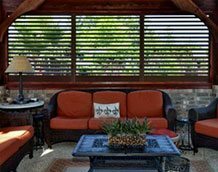 Hurricane Shutters | Shade and Shutter Systems, Inc.
Hurricane Shutters provide safety and security in times of inclement weather and throughout the year. By demand of strict requirement of Top Level Architects, Homeowners, and Builders, this no longer means they need to detract from the beauty of your home. The Storm Shutter Industry, as a whole, have realized the need for improvement of performance, design, ease-of-use, and visual appeal of these products. Today, we’re here to deliver! Hurricane Shutters. Protection with Style. Integrate our high performance rolling hurricane shutters into your new home design for maximum aesthetics and performance. Multiple Features, Material, Colors and Design Options to meet your needs and protection level. 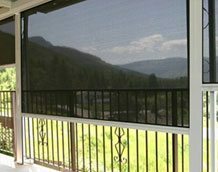 Rolling Shutters provide the greatest protection against sun, wind, and adverse weather conditions. 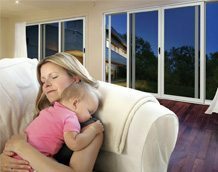 These hurricane shutters are mounted over windows, doors, patios or anywhere a secure insulated barrier is needed. The interlocking slats are aluminum and filled with hard foam for insulation and rigidity. The foam core reduces the radiant heat entering your space. This insulation combined with the “dead air” space between the shutter and the glass, makes a rolling shutter one of the best products available to stop heat, cold, sound, light, water penetration and flying debris. Our VuSafe Storm Panel System is the elegant yet affordable solution for protecting your home against coastal windstorms. Whether for protection against hurricane winds or simple seasonal closure of vacation property, VuSafe Storm panels are the clear alternative. Studies show that engineered storm shutters are more effective and safer to use than plywood panels. Many insurance companies encourage homeowners in high-risk wind zones to install protective hurricane shutters and some have begun to offer discounts or waivers of high wind deductibles. 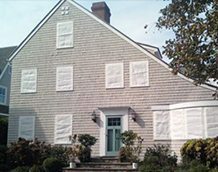 Hurricane Fabric is a great way to protect large areas from heavy rain, flying debris, and severe winds. This woven fabric solution offers protection without the blackout effect and dangers of using plywood. 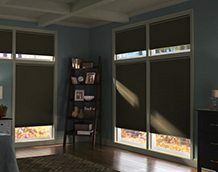 This system is nested firmly in the hurricane shutter family of products because of the unique application uses, and the ability to compliment Rolling Shutter installations. Our Hurricane Fabric can cover structures 30ft high and unlimited width. 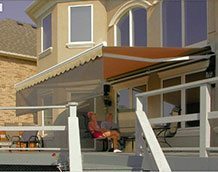 There are several style options including Grommet Screen, Slide Screen, Easy Screen, Strap & Buckle, and Roll-Up Weather Screen. Each of these systems surpass extensive testing to provide quality protection against air envelope overpressure and the damaging effects of negative pressures of hurricane force winds. All rolling shutters can be motorized without changing them! Why should you motorize your hurricane shutters? I love my shutters! Anyone who does not live on the water and thinks they don’t need them should rethink that. I was tight as could be in our ’06 Nor’easter. Your installation timing was miraculous. Thanks! Your shutters just saved my house! Your shutters spared us a great deal of damage to the interior of the house by holding out the storm and wind blown objects. Several times we heard gunshot-like bangs against the shutters as wind driven objects struck the outside. Cannot tell you enough how much we are pleased with our shutters. Now that the hot weather is here, we are using them to keep the house cool by lowering the upper shutters during a particularly hot day. We do lower them when there are storms but also if it happens to be a windy and/or cold night. We find that they help maintain the warmth in the house. I can’t get enough of your product. The peace of mind and the convenience that those shutters bring is beyond what you can imagine until you have them and use them. It’s such a good feeling knowing the place is secure and safe from whatever weather happens while I’m not there. The shutters are the best investment I’ve put into the house. My rolling shutters are the only window treatment I need. With no more worries about weather or security, I sleep more peacefully knowing that I’m safe at home. 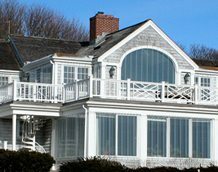 I had a very good experience dealing with your staff regarding the purchase and installation of storm shutters this past December at my summer home on Martha’s Vineyard. Your entire staff deserves to be complimented. Many thanks for your wonderful shutter systems! Hopefully they will not be put to the test and they’ll be my extra insulation and sun protection! Product knowledge and workmanship were of the highest caliber. We also appreciate your efforts in scheduling the installation so that we have our shutters in place prior to the major portion of the Tropical Storm season. Thanks for a job well done all around. 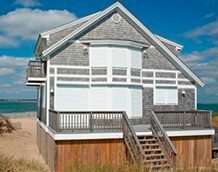 Just a note to share with you our satisfaction with the rolling shutters installed last summer at our Westerly, RI beach property. The installation was completed on time and in a professional manner. The work crew even returned on a Sunday to make an adjustment – I was impressed! Great job. We couldn’t be more happy with the results. The crew arrived on time, installed the shutters and left the job site sparkling clean. It has been a pleasure working with your company. Although the grant process took longer than anticipated, you honored the original quote. This enabled us to finish within the parameters of our funding. Carole Bell, President, Village Improvement Society of Dennis. The advantages of having these roll shutters during a storm and the peace of mind that it gave us far outweighed any other concerns we had about installing them. 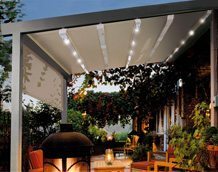 In addition, the added benefits of increased security, UV protection for the contents of the home and increased energy efficiency made our decision even easier. We are very pleased with both the product and Shade and Shutter systems. They have provided great service and support after installation and they provide timely service for any repairs and maintenance of their products. Also, I think our architect was pleased with the low impact of the roll shutters on the design of our home and I think has a more positive view of adding them to an ocean front home. Our insurance company absolutely loved the fact that we added them to our ocean front home! In 1973, I built a house with two large picture windows on either side of my upstairs bedroom. 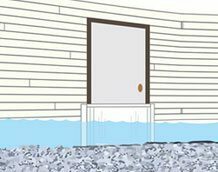 During my first hurricane in the house, I realized that should a tree branch hit and break a window, the horizontal rain of a large storm would come in, go down the stairs, and eventually flood both the upstairs and downstairs. There after, plywood was nailed over the windows, but the boards were huge on the second floor. This was something I could not put up myself, and finding a carpenter with a storm coming was not always easy. I never answer ads, but I did just this once when I saw Shade & Shutter Systems. I installed shutters over the big windows, so now I need only press a light switch and down come the shutters protecting my glass. I also discovered that if I lower the shutters at night, the heat in my house goes up 10 degrees, so I am saving on my heating bill, as well as protecting my house my storms. Needless to say, I am delighted with the shutters, and bit by bit, I am putting them on all my windows. The new storm shutter has performed as expected for this first storm of the year. We had low to moderate ocean spray on the shutter. No noticeable shutter movement or noise. It provides good sound and heat insulation. Better than I expected!